May 17, 2016 – A new NASA study modeling conditions in the ocean of Jupiter’s moon Europa suggests that the necessary balance of chemical energy for life could exist there, even if the moon lacks volcanic hydrothermal activity. 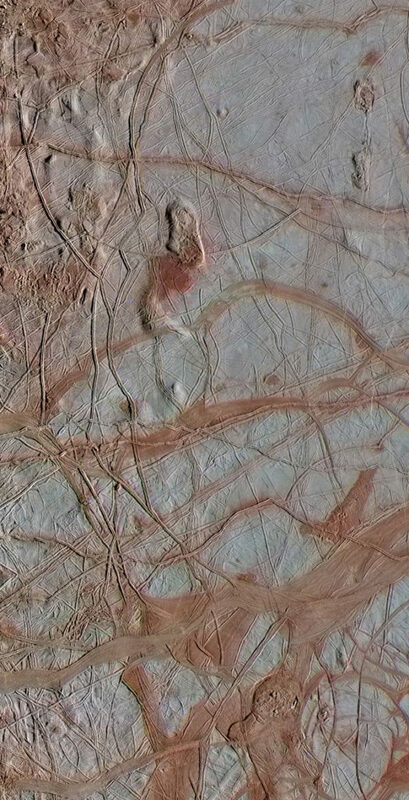 The work draws attention to the ways that Europa’s rocky interior may be much more complex and possibly earthlike than people typically think, according to Steve Vance, a planetary scientist at JPL and lead author of the study. As part of their study, the researchers calculated how much hydrogen could potentially be produced in Europa’s ocean as seawater reacts with rock, in a process called serpentinization. In this process, water percolates into spaces between mineral grains and reacts with the rock to form new minerals, releasing hydrogen in the process. The researchers considered how cracks in Europa’s seafloor likely open up over time, as the moon’s rocky interior continues to cool following its formation billions of years ago. New cracks expose fresh rock to seawater, where more hydrogen-producing reactions can take place. According to Vance, researchers previously speculated that volcanism is paramount for creating a habitable environment in Europa’s ocean. If such activity is not occurring in its rocky interior, the thinking goes, the large flux of oxidants from the surface would make the ocean too acidic, and toxic, for life. “But actually, if the rock is cold, it’s easier to fracture. This allows for a huge amount of hydrogen to be produced by serpentinization that would balance the oxidants in a ratio comparable to that in Earth’s oceans,” Vance said. Southwest Research Institute, the University of Colorado Boulder, the Laboratory for Atmospheric and Space Physics, and Ball Aerospace & Technologies Corp. will all play a role in the Europa mission.